We've all heard of haunted houses -- some people even seek them out, looking for hints of the paranormal. But a haunted Post Office? In this month's edition you'll hear about a Southern California Post Office that many believe is tended to by a friendly ghost. You'll also hear some Arizona customers' opinions about who should be the first living person to be honored on a stamp. As usual, a brief look at postal news headlines concludes the show. Click here to share your comments or ideas for future podcasts. And don't forget, there's more postal news at YourPostalBlog.com. 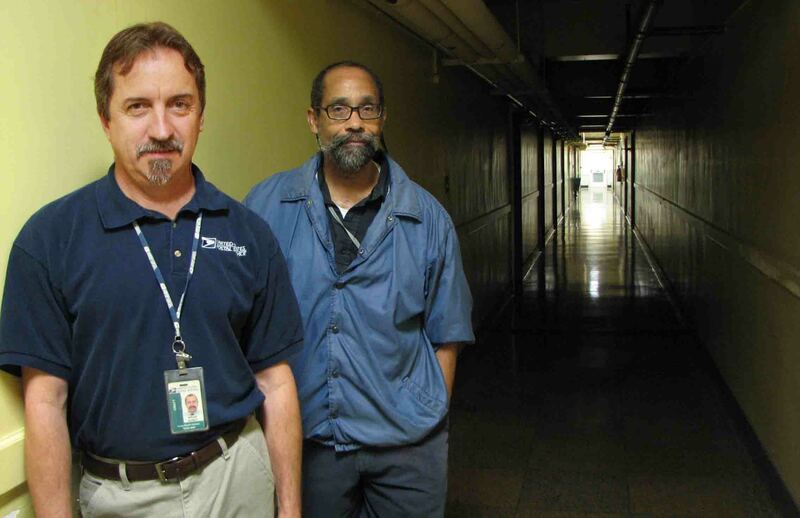 Photo: A spooky place: San Pedro Post Office employees Brian Bundy, left, and Lance McCall stand along one of the hallways in the facility's basement. Click here for a transcript of Your Postal Podcast v.41. To submit a story idea or to comment on the podcast, click here.